The New York Times bestseller about reconstructing your life so that it's not all about work. From the outset the author comes off as a braggart listing the crazy things he's done & so it continues. I read part 1 & gave up. I normally take notes from books I read & am normally engrossed in what I'm reading but not this time. I found myself day dreaming as I was reading so wasn't taking anything in. If it works for you, than great! It did nothing for me. This book is written like a 200 page marketing website, without much in the way of product at the end to buy. It's quite thin on content and big on self promotion and 'here is a success story of someone using this method'. It's like someone wrote a book in the style that Donald Trump speaks - all references to how great he is, how all his friends are great, but little actual substance under the veneer. The content around lifestyle design I have to say is novel and interesting - but like a wedding cake, it's buried under inches sickly, suffocating fondant. 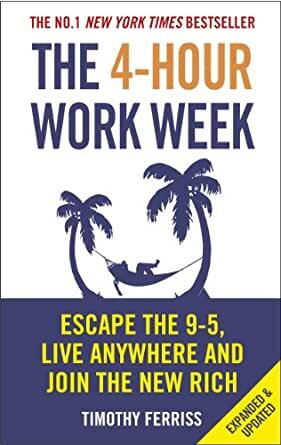 I'm not sure that the practices in this book are relevant to people who have regular day-jobs that require them to be at a desk. Also, some of the practices in the book seemed a little dishonest (ie working 4 hours but pretending to work a full weeks' worth). This book won't be relevant to the average worker (like me), but to those in management or with an on-the-road job where they can set their own hours. Too much hype and not enough substance. Don't understand what people are going on about this book. Not recommended. Now to take action! This has so many gems to get you started with your special muse (business) as well as practical advice which still rings true today. This is full of ideas. A book in which anyone will find at least one piece of actionable information that can be Incorporated into their lives for the better.